We pride ourselves on hosting tournaments in the most professional manner possible. Bowl 4 games across 8 lanes with the highest scratch total taking the top prize. We will feature optional side pots which are returned 100%. Featuring a challenging pattern every year. Test your skill and chase down some money! Walk-ins are accepted based on lane availability however reservations are recommended. Have fun with your sweetheart before Valentine's Day. Bowl 3 games of no-tap with optional high game side pots. The highest 3 game total with handicap wins it all! Attention junior bowlers! Join us in March for our 1st annual Junior Gold Qualifier & Scholarship Tournament. Contested on a modified house condition. 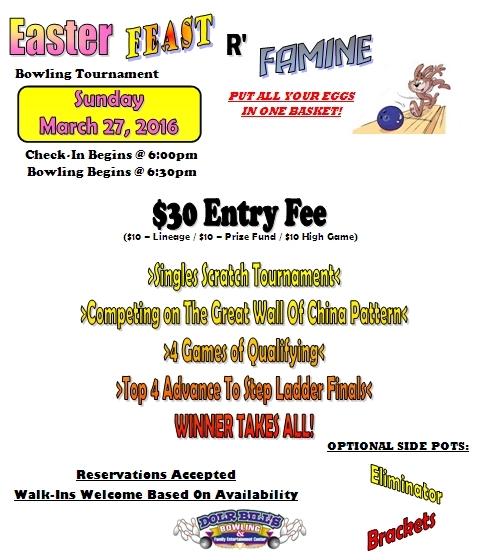 Bowl for your spot at JOG or just win some scholarship money! Contact us to reserve your spot. Take the plunge and put all of your eggs in one basket. A winner take all tournament with step ladder finals. High game side pot is included in the entry fee. The contest will be held on the Great Wall Of China bowling pattern. Contact us to reserve your spot. Earn points based on finishing position with the top 4 earning an invitation to a step ladder final. We will feature optional side pots which are returned 100%. Featuring a challenging pattern every tournament selected by the previous winner. Test your skill and chase down some money! Walk-ins are accepted based on lane availability however reservations are recommended. Bowl 4 games across 8 lanes. Highest handicap total will take home the top prize. Entry fee includes high game side pot. Stick around after the tournament for food and beverage specials!